My name is Tamsin North and I like pretty things. Pretty things and special things and lovely things. I love the little thrill of getting a package in the mail containing a lovely thing, and I love how a very special thing can continue to delight me for weeks, months and years. This makes me a bit of a materialist, doesn't it? A lot of my love for things stem from the sentiments I attach to them. I've hauled around the same toy dog to every place I have lived since about 1982 (with the regrettable exception of four months in the dorms when I was trying to be a grownup), I keep a small plate from my grandmother's kitchen on my nightstand and struggle to get rid of the scruffy pair of shoes I got engaged in. Every once in a while I'll form a sentimental attachment to a new thing, like the little stamp pictured above. 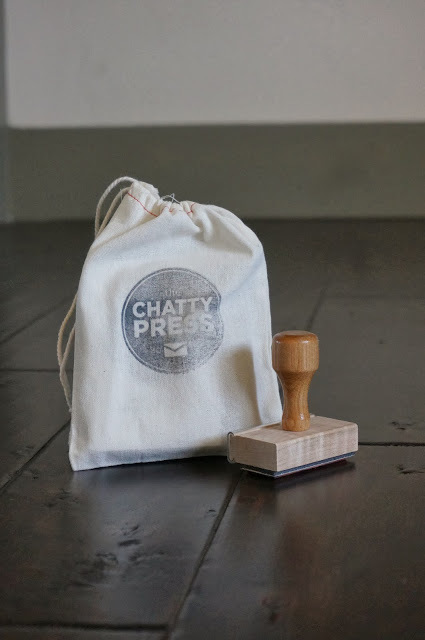 We had it custom-made with our new address on it by a company called Chatty Press, and it is just the loveliest little thing. I love seeing our names together, and it just feels like a little declaration of love and fidelity to our new home. It's like saying "House, let's make this official. We love you, we're staying here and we've had a stamp made to prove it!" If you would like me to write you an old-fashioned, in the mail letter, leave me a comment, and I will. That way you get something (hopefully!) more fun than junk mail, and I get to use my stamp. Win-win! Naturally there are a few details to work out, like I need you to give me your address, but I promise I won't do anything more nefarious with it than writing it on an envelope. And if absolutely hoards of you (say, more than 10?) want a letter, I will probably pick out a handful of you to write to. And then there is the awkward possibility of no one wanting a letter, but I will bravely face that on my own and console myself by practice-stamping on a sheet of scrap paper. I will contact you for your address via email. I will then write and mail you a letter. You will receive said letter, admire return address stamp on envelope, and then (in my imagination) read the letter on the way back from the mail box. Or perhaps curl up in a favorite chair during a quiet moment to read it. There might be cocoa involved, I'm not sure how you roll in this particular instance. As much as I'd like to think I was that cool, this is not a sponsored post. I highly recommend Chatty Press, but they don't know that and aren't compensating me for telling you that. Also, please note that I made it through this entire post without a single "stamp of approval" joke. Lots of hours clocked on the road rug. Shall we just continue our little house tour? Seeing as I spent most of Friday morning cleaning up/excavating the play room, let's go in there next. I should tell you that it doesn't often look this neat and tidy, and that whenever I comment on the state of affairs in there, Espen will say: "Mom, it's not a mess, it's just a play time!" And so 95% of the time, I just roll my eyes (lovingly, of course! ), shut the door and let him have at it. But you caught me during the other 5%, when I declared it time to "clean up, clean everybody, everywhere, clean up, clean up everybody do your share" and put everything in its place. I realize that having a designated play room is a pretty suburban, petit bourgeois thing to have, and it is absolutely a luxury. But I was so sick of having our living space completely dominated by toys, that a play room, or in the very least a separate play area, was pretty high on my list of wants for our new house. As well as simply containing a lot of the kid clutter, I wanted to create a very kid-centric space for playing in. We're hoping this will be the house the kids will remember as their childhood home, and want to make it feel like a home for the whole family, and a play room definitely goes along with that. We shop at IKEA - can you tell? We were lucky enough in our new house to have a bit more space than we currently need, and so we found ourselves with kind of an "extra" room on the main floor. It's right next to the front door (so not very private) and doesn't have a closet, so it's not ideal for a bedroom, and we didn't really need a whole room for a home office (more on that solution in a future post), so it became the play room. It's nice because it's on the main level, so Espen and soon Gwen can play in there and still be close to me, without having me looming over them the whole time, which is especially nice for play dates. The kids are within earshot, but the parents can chat in comfort in the living room. The play room also has two big windows and gets lots of daylight, which I love, especially during the colder months when we spend less time outside. I love the deep window sills for displaying and storing toys. Our house has a big, unfinished basement, so the longterm plan is to include a play room in our plans down there, at which point this room would become an office/library/hideout hybrid (I'm thinking wall to wall shelves stuffed with books and a couple of comfy armchairs). Because of that, we haven't done anything even semi-permanent to this room. I'd love to hang a shelf on the wall, or maybe a mobile or two from the ceiling, but haven't gotten up the courage to make holes in anything yet. It could well be years until we finish the basement, so time will tell how long I can wait on that one. Gallery wall, play kitchen and dress up box. I'm pretty happy with our current modus operandi for the walls, though. I have hung a few posters with washi tape, but then we're in the process of covering (at least) one wall with Espen's (and my!) own art. One of his very favorite things to do is to paint with me, and after they have dried we pick a few favorites and hang them up on his gallery wall. It won't be too much longer until Gwen joins in and makes her own little mark too. I just unceremoniously stick them up with Scotch tape, often letting Espen hang a few himself. He likes his favorites to be low down where he can see them. Definitely not the fanciest in home decorating, but I honestly like how it looks and that it gives us a place to display Espen's work without cluttering up the fridge or coming up with some complicated system. I'm looking forward to when it covers floor to ceiling! The play kitchen: where Chef Espen works his magic. If you look closely, you'll see that a lot (a lot!) of our kids' furnishings come from IKEA. There are a few reasons for that, the biggest one being we live 30 minutes from a store. But I also happen to think that IKEA does children's stuff really right. Besides being clever and stylish, the things we have bought from IKEA just really seem to appeal to kids. And they get big bonus points for being gender neutral enough for boys and girls to play with and aren't plastered with whatever registered trademark your child happens to be enamored with at the time. I know lots of little boys that love to play kitchen, but it can be tricky to find one that's not incredibly girly. And there was certainly a time when it was tempting to buy Lightning McQueen-encrusted everything for Espen because he loved Cars so much, but that love affair seems to have cooled a bit these days. It gives things a bit longer life, I think. I also really appreciate that IKEA children furniture doesn't tend to be as huge as a lot of the other kids' stuff out there. Floor space is important in a play room! Circus tent, rocket ship, nest or comfy spot? Pictured above is a little reality blogging. Espen does this thing that we call nesting, where he will chose a spot and then round up all sorts of toys, pillows and blankets and cram them and himself inside. He often plays this game where he's preparing on an expedition in his rocket ship/IKEA tent, and needs to pack provisions for his space mission. Can you guess? Well, it involves shoving absolutely every toy he owns inside the tent and then lying on top of them. And it drives me absolutely bananas. Not only do toys get broken from this game, he also spends the next several days asking "where's my...?" Sigh. In light of just how much this bugs me, Espen might not be the one who has issues in this scenario. 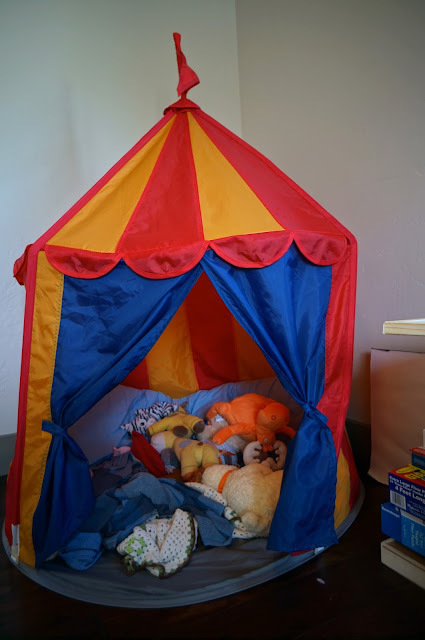 Be that as it may, when I cleaned up the play room, I started by cleaning the mass jumble of toys out of the tent and replacing it with a big pillow, a couple of blankets and a gang of soft toys, and now it has become a favored hanging out spot. Hopefully this will last a while and keep us both happy! Even if we won't be moving it to the basement for a while, I do have a bit of a vision for the play room. First of all, things will start to change once Gwen gets a bit more mobile and starts playing in there. Her birthday is coming up in a couple of months (yikes!) with Christmas hot on its heels, and that's going to mean more toys, and an increased need for storage, so a shelf or something might be nice. I'd also love to get a comfy chair in there for adults to join in the games or maybe read a book without having to sit on the floor. And something to hold library books so they're accessible, but don't get lost all over the house would be nice too. Maybe this or just a simple bin? And (if we can fit it with the rest of my grand visions!) a kids' table and chairs would be nice too. I've got my eye on this one. Maybe for Christmas? And that's the play room! Do you have one? Do you want one? 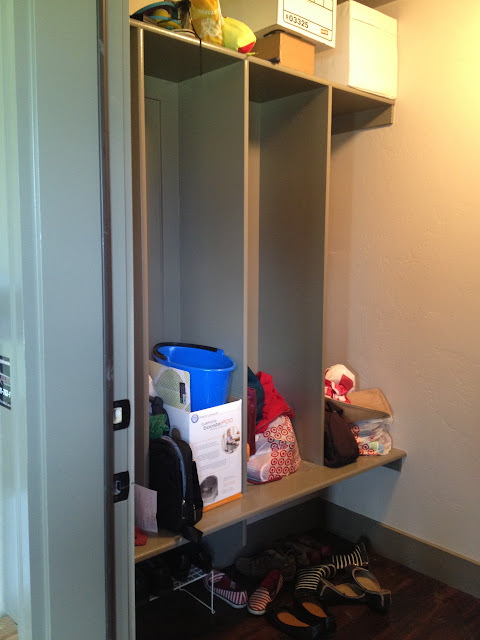 How do you solve the never-ending deluge of kid's stuff at your house? Spill. 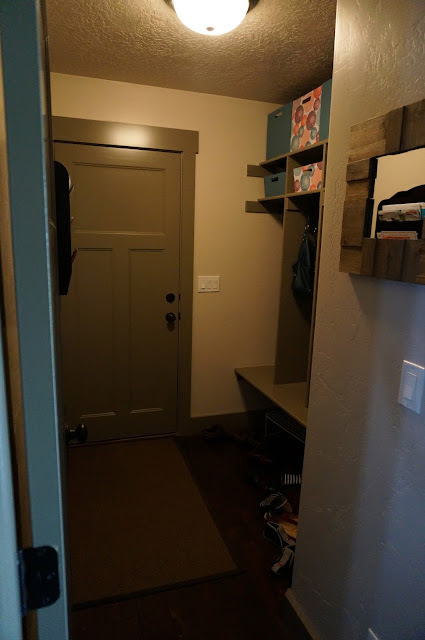 I said I'd show you the shelves Nick built, and I believe I promised a house tour of sorts, so why don't we start with the mudroom? I realize it's a little unconventional to start a bloggy house tour in the mudroom, but don't you think you'd be the kind of friend who would come into our house through garage like family rather than all formal-like through the front door? I do. Anyway, If we're going with the premise that this is the sort of blog that does house tours, I think we ought to start with some "before" shots. These were taken back in March, when we were first under contract on the house. See tiny Gwen in her car seat? A mudroom? 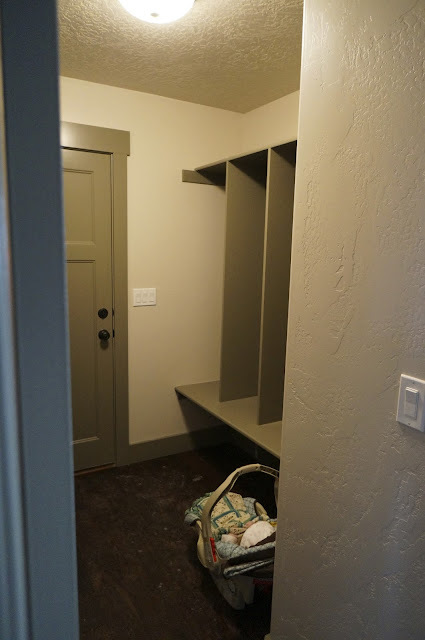 I've always wanted a mudroom! So I rolled up my sleeves and found a home for most of the stuff and got some storage baskets for the shelves and the top, and things were greatly improved. But the cubbies sadly remained a bit useless. 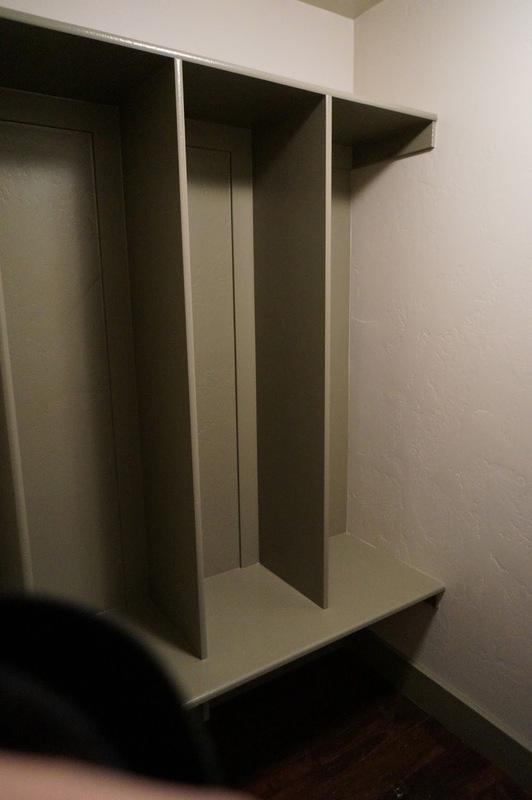 Then our TV-free week rolled around, and on the very first day Nick came home with a load of lumber, and set about building a shelf at the top of each cubby. And in a few evenings of work, this is what he came up with! He's pretty clever, right? Now we each have a cubby with three double hooks and a shelf and a basket for hats, gloves and whatnot above. 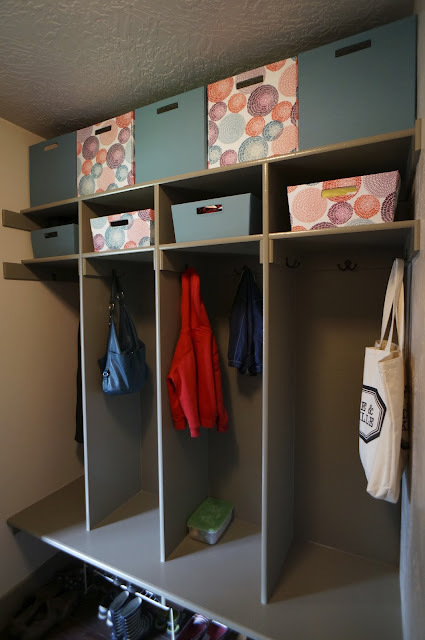 We also added five bigger storage bins above for outdoor toys, sports equipment and other stuff we want on hand, but don't need to access every day. I also like that bin add some color and interest to an otherwise plain and small room. I plan to personalize each of storage basket with a tag or something with everyone's initial. Maybe like this or this? Shoulda cleaned up the shoes. In the above photo you can glimpse the other two things we've added to the room: there's a mirror for checking your teeth on the way out the door on the right, and a mail and key organizer on the left. You can also see it reflected in the mirror, reminding me that I need to look through the incoming mail. That thing has been such a life saver on the clutter front! I'm also planning to add a cheerful print next to the door, maybe this one? Anyway, that's our mudroom! I'll do more rooms as we go and as they are presentable enough to invite the world into. Not that you would judge me, because that's just not you, is it? UPDATE: A few of you have asked, so let me tell you: The bins and baskets were from Target, although I can't find them online, and the mail and key organizer is this one from Amazon. This morning Espen came into our room like he always does, we got him dressed and ate breakfast like any other morning, and then... he went off for his first day of school. I kept bracing for the tidal wave of emotions that inevitably happens to mothers on these milestone days, but (so far, at least!) it hasn't come. Not even when he puckered his little mouth up to mine for a goodbye kiss - in front of all of his friends, old and new. Not even when I walked out of the classroom where he was too busy playing to really care that I was leaving. 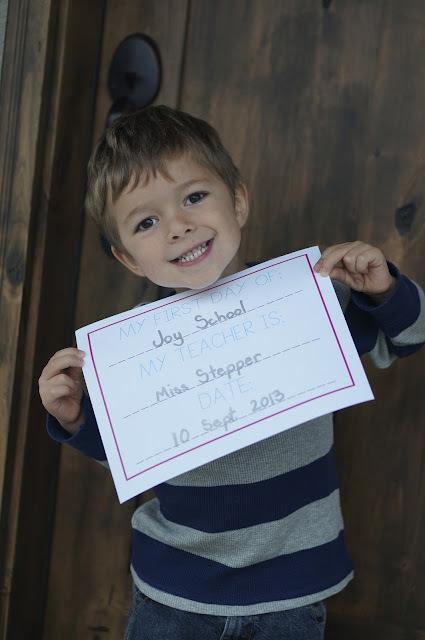 To be fair, it's only Joy School. It's only for three hours, two days a week. It's only in the home of our dear, dear friend who has known and loved Espen since birth. 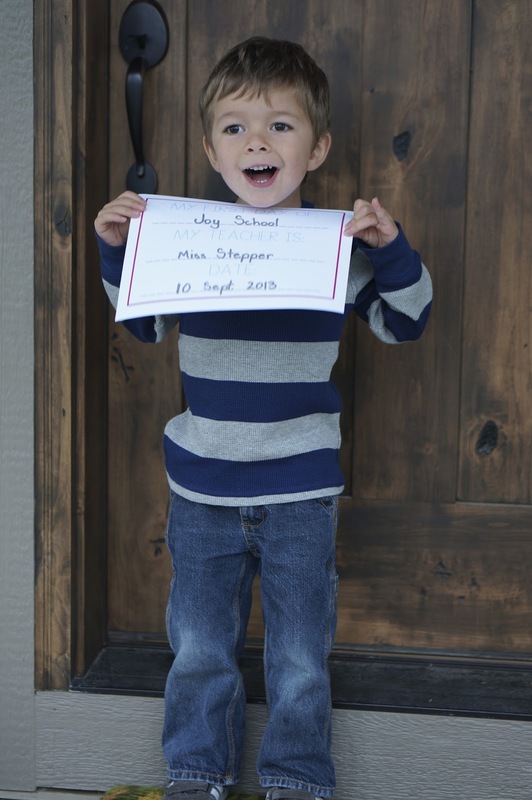 There are only five children in the class, two of which are Espen's best friends, and two more who will soon be part of his pantheon of playmates. He's not exactly going off into the lone and dreary world to fend for himself amongst uncaring strangers. But still, it marks the end of an era. Espen is no longer tucked completely under the safety of my wing. He is starting the process of becoming separate from me, and that does squeeze my heart a little. That little boy is growing up. Ever so slowly, but it is happening. That soft little baby I held in my arms is undeniably gone for ever. And yet, the emotions I'm feeling today aren't of sadness, loss, nostalgia or wistfulness. What I feel today is joy and excitement for my little Espen. Today marks the beginning of a Great Adventure for him. Oh, the places he'll go and the things he'll learn! School is a place for friends and fun, and a place to explore and learn and grow. And as we start with Joy School on carpet squares in Miss Stepper's basement today, I can't help but look down the path he has taken his first little steps on, to the places of education that will light our little boy's heart on fire as he learns about the things, whatever they may be, that will become his passions and interests. After a faithful heart and a loving family, there's nothing greater I could wish for for my Espen than a love of learning. And today he is on his way. A Week of No TV - Reporting Back. Nick works on ye worlde famous shelves. One Monday night Nick, determined to take advantage of a week's worth of open evenings, came home with a carful of lumber to build shelves in the mudroom. I've been hoping/begging for them since we moved in, so even though it meant saying goodbye to the evenings spent holding hands and conversing deeply by candlelight that I had imagined, I was pretty excited to get this project underway. So we (mostly Nick) spent the following couple of evenings measuring, sawing, drilling and whatnot until we had some mighty fine shelves in the works. I'll try and show you later in the week. Meanwhile, another project was underway. We've spent most of the summer trying to get our previous home ready to sell, and last week we got to the point where we knew it was just a matter of a few hours and a lot of hard work before we could list the house. So on Thursday night I drove down there and mopped and scrubbed everything in sight while Nick stayed home and painted the shelves, and on Friday night I stayed home with the kids while he went to work on the townhouse. Again, not quite what I thought we'd be doing, but knowing that we had those evenings free and available gave us the extra motivation to get things done. And friends, our house goes on the market this week! Truth be told, we didn't just work the week away. One night we curled up with books and popsicles, one night we listened to a favorite radio show together (Wait wait... don't tell me! ), one night we had a late dinner for just the two of us and some takeout, and one night we played boardgames with family. As busy and tired as we were, we also found time to just talk and be together. Did we miss the TV? Absolutely! It has just become our go-to activity, and especially beloved on nights when we're tired and just kind of done for the night. Saturday night was maybe the hardest, because we had finished the shelves and finished getting the townhouse ready, and after we had put the kids to bed and eaten our takeout, we were just a little at a loss for what to do before bedtime. Nick started editing some photos, and then I really didn't know what to do with myself. That's when I thought to listen to a Podcast, which was a nice way to be together, while still doing allowing Nick to keep editing, which is what he wanted to do, while I really just wanted to relax. We talked a bit about our experiences on Sunday night (as we watched the clock tick ever closer to our our hour of freedom) and concluded that it was a good exercise. We learned that we can be incredibly productive people when you take away the distractions, and we confirmed that there are a lot of other things we enjoy doing besides connecting to Netflix every night. However, neither of us really felt any desire or need to start scheduling regular TV-free nights or weeks. A better fit for us would be telling each other "hey, can we spend the night working on project X/reading books/just relaxing and talking? ", which I think is what we are going to do. I also liked that disconnecting from the TV made me feel a little more connected to Nick, if that makes sense. Less distractions = more brain power to focus each other. And while we did indeed make a bee-line for the DVR after the kids were in bed last night (what was happening on Broadchurch?!? ), I think we've reminded ourselves that it's not the only way to spend an evening.